I have been spending a little time lately looking round the fabric shops of Lancashire. So it was inevitable that I would get to Abakhan soon, as recommended by Maria Josephine. The Abakhan name is common in Turkey, although it seems the family that started the chain originated in St Petersburg. Today they have a range of shops throughout Estonia, Latvia and Lithuania, as well as in the North of England. Why not London Mr Abakhan? There are several of these shops throughout the Noth West, with their biggest shop in North Wales. If you are nearby it is certainly worth a visit. Although the prices are reasonable rather than cheap it is an amazing experience if you like hunting through shelving units stacked with a wide range of remnants. These fabrics are sold by the kilo. Of course you may not want a kilo! You may not even want the piece of fabric as a whole. They will cut meterage from the remnant so long as there is one metre left for the next person. They also have perfectly nice cloth by the metre on traditional rolls. The other things that were interesting were the bags of assorted haberdashery – cottons, ribbons, etc. And the most lurid fake fur I have ever seen. I imagine this might be fun if you are planning a fancy Yeti party. Or maybe there is something here for Jungle January? The 20 staff in the shop were universally helpful and engaging. Here is Denise in the black Abakhan uniform. She (and I) discussed the right colour for the ground and batting for a child’s quilt. They have got a website too. They apparently send A4 samples for £1. Nothing like rooting around though, in my view. That store is huge! Wow! Your so lucky! C’mon, you don’t need this in London! Maybe branch out to the North East, though. I’ve never been to Abakhan but it’s certainly on my radar. I’m not sure how fabric by the kilo would compare to cost by meterage. Yes I was worried about this initially Anne, but the fabric is around £3m for cotton and lightweight cloth. Although I recommended Abakhan, I live in London too and I also wish they would open a branch here. I have been to the Bolton branch, but more regularly go to the one in Manchester when I visit my daughter who lives there. One added detail of interest to others who have reached my age, is that on Fridays they give pensioners a 10% discount on all purchases (with evidence of eligibility). Yes the Goldhawk Road shops are quite a resource, but they can be a bit samey. Also slightly overwhelming – I always think I might find better in the next shop. I do admit to a couple of favourites. Thanks for the review. I’m trying to buy less online, so appreciate reviews of the shops, especially nearer me. Have you tried Fabworks in Dewsbury yet? It might be a bit far for you from Lancashire, but well worth a visit if you’re local. No Karen I haven’t. For now I am going to stick to Lancashire as I can zip out while my Mum has a snooze!. Who knows maybe I will get round to the Midlands when we are based in the Cotswolds. I realise I could be doing the same thing in London. Maybe you could do a review of Fabworks – half a dozen photos and maybe 500 words? I bought some fabric by weight. I bought just over 3m of stretchy jersey (2m of green, looks like Malachite, and 1m of grey stripe), or .890kg, and 0.595kg of blue napped wool, which worked out at about 3.50m for the jersey and £6.50 for the wool mix. And a mixed selection of Coats sewing cotton – around 20 reels for £3. Why not London…well I expect the price of floorspace has something to do with it. They certainly have a vast range. I lived in parts of the North West for many years and visited the Abakhan stores in Manchester, Preston, Bolton, Chester and North Wales at various points. North Wales is my favourite as it is large site out of the town, they are all too far away now I am over in Derbyshire. 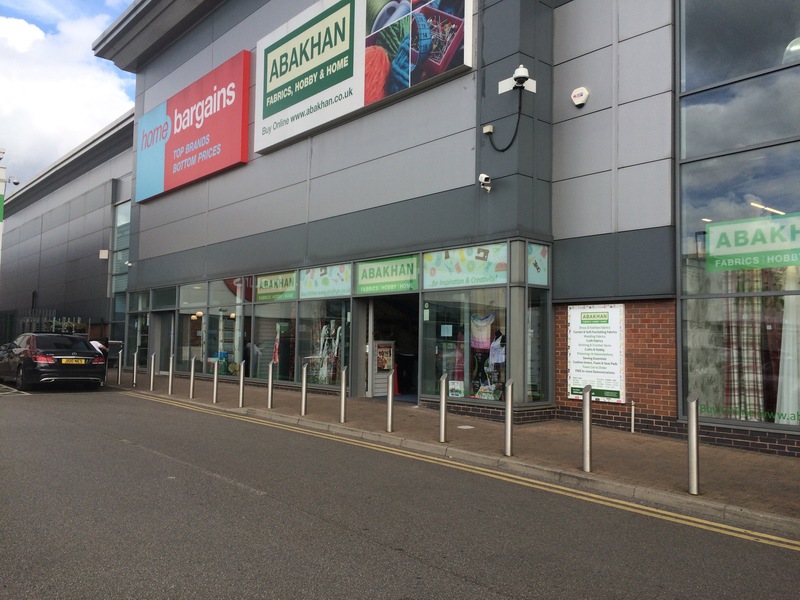 Whilst I like abakhans (they are my only closest fabric store – boo hoo), I don’t love it. I have issues with their quality 🙁 I only buy off the bolt now from them unless it’s for muslin / dress up.